Mammography is the process of using low energy X-ray (usually around 30 KVP) to examine the human breast, which is used as diagnostic and screening tool. A mammography exam is also called as mammogram. The goal of mammography is the early detection of breast cancer typically through detection of characteristic masses and / or micro-calcifications. It is also known as full field digital mammography (FFDM). The replacement of x-ray film by solid state detectors converts x-ray into electrical signals. It is quite same as the detectors found in the digital cameras. 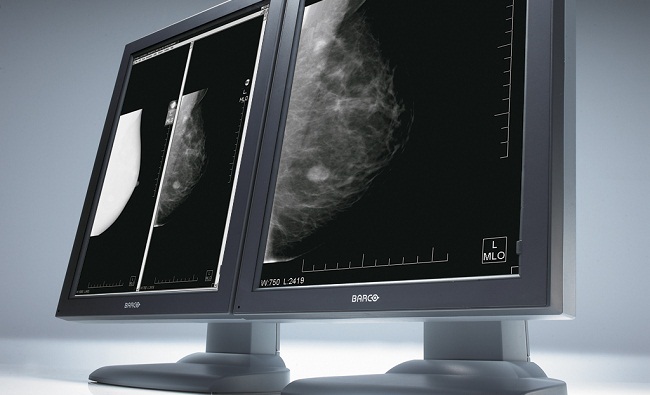 These electrical signals are used to produce images of the breast to be seen on a digital platform like a monitor or special film similar to conventional mammograms. As a general frame of references having a digital mammogram is essential same as conventional film mammogram. Even before a patient line missing or the symptoms of cancer. Mammography can detect breast cancer. The guidelines from U.S. department of health and human services (HHS), the American cancer society (ACS), the American cancer society (ACS), the American medical association (AMA) and the American college of Radiology (ACR) suggests mammography every year for every women stepping at age of 40. At early stages breast cancers is curable. Research has shown that annual mammograms can save many lives. In addition to this the National Cancer institute (NCI) has recommended that women have had breast cancer and those who are at risk due to genetic history of breast cancer should seek medical advice for frequent diagnosis and diagnosis before age of 40. Abnormal clinical findings like breast lump or lumps found by the person or by her doctor can be evaluated by diagnostic mammography. Must and More, Delhi is equipped with Siemens Mammomat 3000 Mammography unit comes in a shape of a rectangle. A tube is connected to the upper portion of rectangle which produces x-ray. An attached unit acts as a device to hold and compress the breast and position it so images can be obtained from any angle. Breasts are usually tender during menstrual cycle so avoid mammogram during this time. The best time for mammogram is the following week of your periods. Any doubt or information regarding pregnancy should be disclosed in front of the radiologist or doctor. Avoid the use of deodorant, talcum powder and lotion under your arms or on your breasts on the day of examination. This can cause calcium spot in images. Have a brief discussion on any issue or problem in your breasts, describe all symptoms before any mammogram to your radiologist and doctor as well. If you have any previous reports of medical diagnosis including mammograms. Provide it to the doctor. Keep track of your results, do not assume anything and have a proper consultation with mammography facility. Mammography is performed on an outpatient basis. As the procedure will start, A radiologist will ask you to position your breast on mammography unit. Your beast will be positioned on a special platform and compressed with a paddle (paddle can be made of clear Plexiglas or other plastic). As a necessity, thickness of both breasts should be same so all of the tissues can be visualized. It spreads out the tissue so that small abnormalities are less likely to be obscured by overlying breast tissue. It allows the use of lower x-ray dose since a thinner amount of breast tissue is being imaged. It holds the breast still in order to minimize blurring of the image which can be caused due to any movement or motion of breasts. It reduces x-ray scatter to increase sharpness of the picture. Note: You can be asked to change position between images. There will be two frames one is top to bottom view and the other is (angled) side view. Same process will be repeated for the other breast. Keep in mind: Do not move, a very still position is required. In some cases you may be asked to keep from breathing for a while till the x-ray picture is taken to reduce the possibility for a blurred image. The radiologists or technician will walk behind a wall or next room to activate the x-ray machine. The examination process will take about 30 minutes meanwhile you will be asked to wait and Co-operate with the technician. The thorough analysis and evaluation is performed by our specially trained technicians and radiologists, who will analyze the report and send it to the referring physician or your doctor to discuss the result and outcome with you. You are also qualified to look at the reports and discuss with your doctor. Some result are suspicious any new discovery without any prior symptoms raises a doubt so a follow up examination can be recommended. A follow up examination is also required to monitor the abnormality continuously. It will also make you certain about the treatment if the treatment is effective or not. If the cancer is detected in its initial stages it is treatable and gives a chance to doctor to make you better by reducing tumor. Mammography increases the chance of detecting small abnormal tissue growths confined to the milk ducts in breasts called as ducted carcinoma in situ (DCIS). Mammography is the only reliable method to detect cancer tissue in breasts it also helps in finding invasive ductal and invasive lobular cancer. There is no residual left behind after the mammography is done. Special care is needed during x-ray examinations to get best resolution of images and for lowest radiation dose. All radiology protection organizations review the technique standard used by radiology experts. 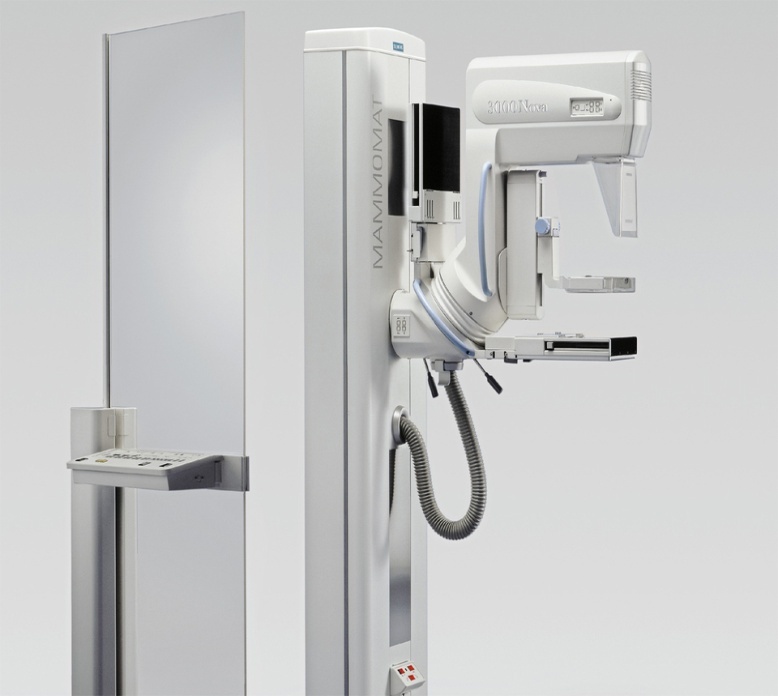 Our Siemens Mammomat has limited X-ray beam exposure and makes sure for low dose of radiation. In other words, other parts of body receive minimum amount of radiation which is harmless. Images obtained in the starting of mammography procedure are not enough to determine benign or malignant disease with accuracy. It depends on your radiologist if there is any suspicious activity then he/she will decide for further diagnosis. Each person has different physic so the interpretations of mammograms are difficult because of various shape of and sizes of breasts. The image obtained by mammograms can be compromised because of the power or salve on the breasts or the person has been undergone breast surgery. A radiologist may recommend more mammograms and ask to bring previous results as well to compare the images because itג€™s hard to visualize breast cancer with a single image. Breast implants with silicon and saline are not transport on X-rays it blocks a clear view of the tissue behind them especially if the implant has been placed in front of instead beneath the chest muscles. Expert technologists and experienced radiologist are well aware of how to carefully compress the breasts to improve the view without rupturing the implant. Women having implant should confirm prior that the radiologist and technician is experienced in performing mammography on patients with breast implant. Though mammography is the best possible tool for breast cancer diagnosis, mammograms are not 100% effective and do not detect all breast cancers. In all over the world research has been done on several breast imaging techniques to improve the accuracy in distinguishing non cancerous breast conditions from breast cancers.